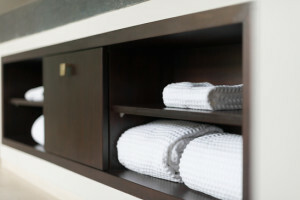 Are you having trouble organizing your bathroom storage area? As you may know, the bathroom is one of the most important rooms in your household and you need to find the right setting and design for your bathroom, to avoid a messy and cluttered bathroom. If you are worried about bathroom space and want to have a more organized bathroom, then these bathroom storage ideas are here for the rescue – store your creams, ointments, disorganized bottles and medicines properly without creating havoc in your bathroom. Do you need more room in your bathroom to store all your little knick knacks and makeup kits? Then you need to re-think your bathroom design! You can install recessed shelves in order to store away your toiletries from sight and to keep your bathroom from being cluttered. You can maximize the space in your bathroom by installing shelves, cupboards and cabinets. Utilize the Space underneath the Sink! Another great bathroom storage idea is to use the space underneath the sink. You can place small storage boxes under the sink with proper labeling. This will help you keep your bathroom organized and you can have more space inside the bathroom as well. The placement of the boxes is also important, and you should place the boxes with the items you will use regularly right at the front so that you can access them easily. Most bathroom storage ideas refers to the need of saving space and another way you can do that is by using the space behind the bathroom door. You can save a lot of space by hanging little cloth bags behind the bathroom door and putting in toiletries, medicines and even towels. If you want to save more space then you can install a bathroom vanity too. This will allow you to maximize your space so you never have to worry about bathroom storage space ever again. One of the most infuriating things for many people is what to do with toilet paper, since letting it hang on a hook is not what they want. You can easily solve this problem by placing a little basket next to the toilet or by having it hanging inside a vanity close to the toilet. The main idea is to keep the toilet paper accessible, but out of plain sight. Other Innovative Ideas for Bathroom Storage! A bathroom storage project is not going to cost you a lot of money, since most of the bathroom storage solutions are available at fairly reasonable prices and you can easily re-arrange or re-design your bathroom without burning a hole in your pocket. However, if you really want to spend the minimum amount on your bathroom storage and yet get the best solutions in the market, then you need to look at some of these innovative ideas for bathroom storage. Get more style and storage in your bathroom today, with these fun, frugal and creative bathroom storage ideas. 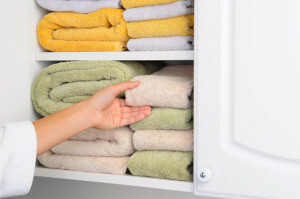 Need a place for towels and other unwanted clothes in your bathroom? Then you can simply hang a vintage basket on the wall for a great bathroom storage idea. It will not only look pretty, but will also solve the storage problem. You may be wondering what these little beauties are there for in the bathroom? Well you can easily store any toiletry in these glass canning jars and the best part is that they cost practically peanuts. You can store soaps, washcloths and any other toiletry that you desire in these jars and get a great bathroom storage option. Do you want a great bathroom storage idea without spending a lot of money? Then you should turn your old drawers into wall storages in your bathroom. It is a great way to save space and will also provide your bathroom with a unique look. A great place to hang towels is on budget handlers. Your towels will remain accessible and won’t fall off these bad boys easily as well. You can have them installed in your bathroom and make your bathroom standout from the rest of the crowd. If you require a great bathroom storage idea then you need to get spray painted terra cotta pots. They hardly cost anything and are extremely useful for storing toiletries. They are available in different textures and designs, which makes them perfect for innovative bathroom storages. They can easily be found from your local flea markets and are extremely useful for saving space in the bathroom. The built-in or hanging toothbrush holder is an extremely creative idea when it comes to bathroom storage. You can easily create your very own personal toothbrush holder by creating small notches in any bathroom shelf near the sink. A great way to save space and it also looks good as well. In order to really take advantage from bathroom storages, you need to find fake built-ins. You can simply use existing shelving and add wood brackets to them for storing and organizing all the different toiletries in your bathroom. You can easily find a lot of different types of fake built-ins in order to save space in your bathroom. The Best Bathroom Storage Ideas of All Time! These bathroom storage ideas are designed to provide you with a great new design for your bathroom. Not only will it allow you to save space in your bathroom, but will do so at the very bare minimum cost and you will get to experience a drastic change in the appearance of your bathroom. So say goodbye to all those mornings in which you are stumbling over toiletries and slipping on towels in your bathroom. It is important to remember that not all bathrooms are of the same size and therefore you should carefully select bathroom storages for the type of bathroom you have and the amount of space you want to save. Obviously, the factor of cost does become important and if you have cash to burn then you can get some truly spectacular bathroom storage ideas for your bathroom. You can easily save a lot of money when you are looking to redecorate or renovate your bathroom, and these innovative bathroom storage ideas can help make a difference by providing you with affordable measures that will help you get the best bathroom storage solutions at the lowest price possible in the market. So what are you waiting for? Get ready to install some of these creative bathroom storage solutions today.